Greg from MoreMobileSoftware just released a free update of Dive Log for Apple iOS devices. 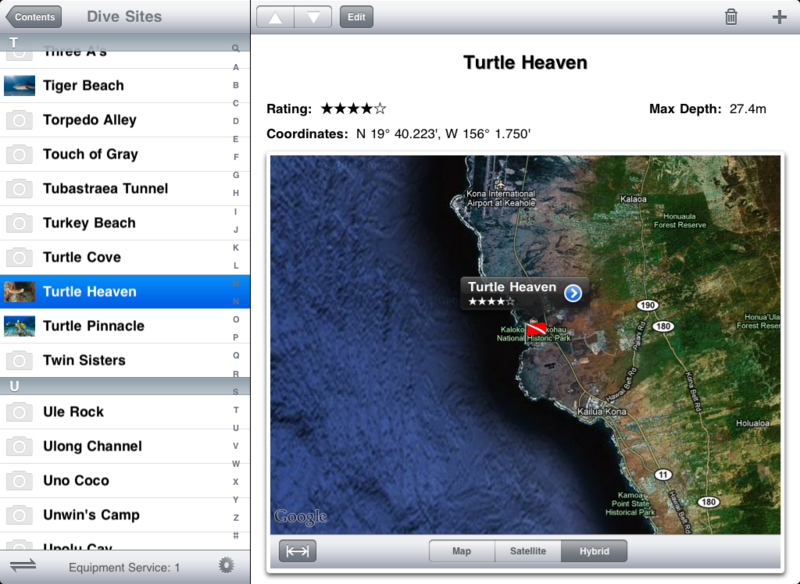 It contains now a native version for the iPad, which makes full use of the big tablet screen. 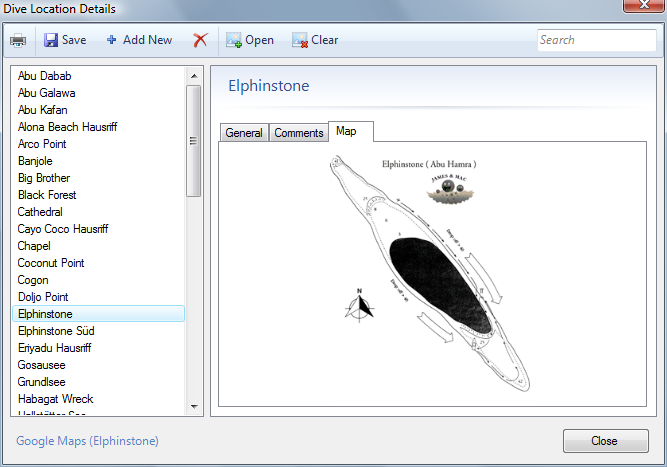 It really looks great as you can see in the screenshots below and of course it is fully compatible with Diving Log 5.0. 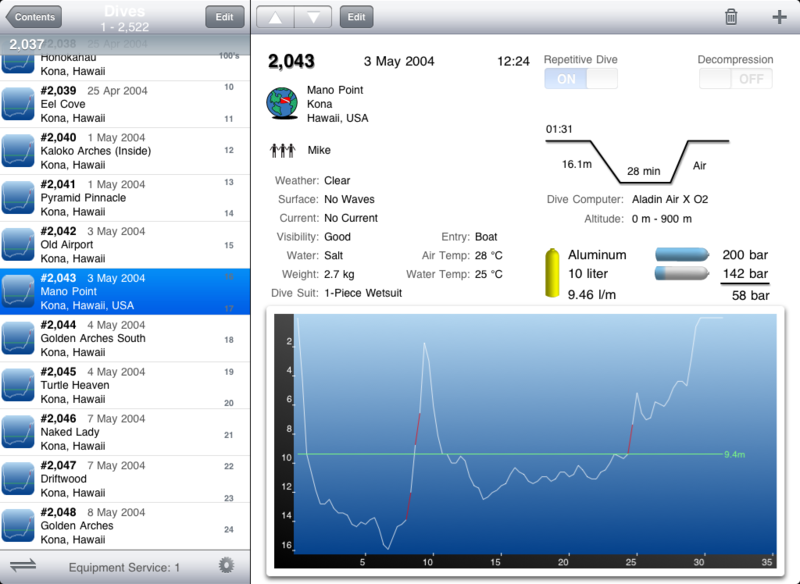 When you’ve run an older version of Dive Log on your iPad you will get automatically the new tablet UI after the update. 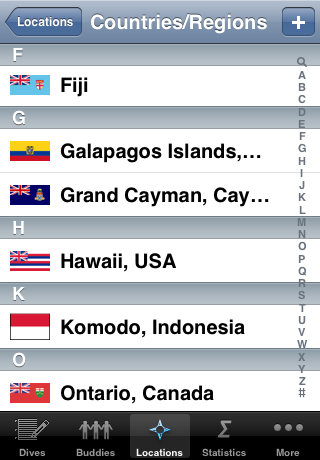 • Support for iOS 4 and the most recent phones. • Certifications are now sorted by date in the Personal tab. • Call, or email Buddies from the Buddies tab. 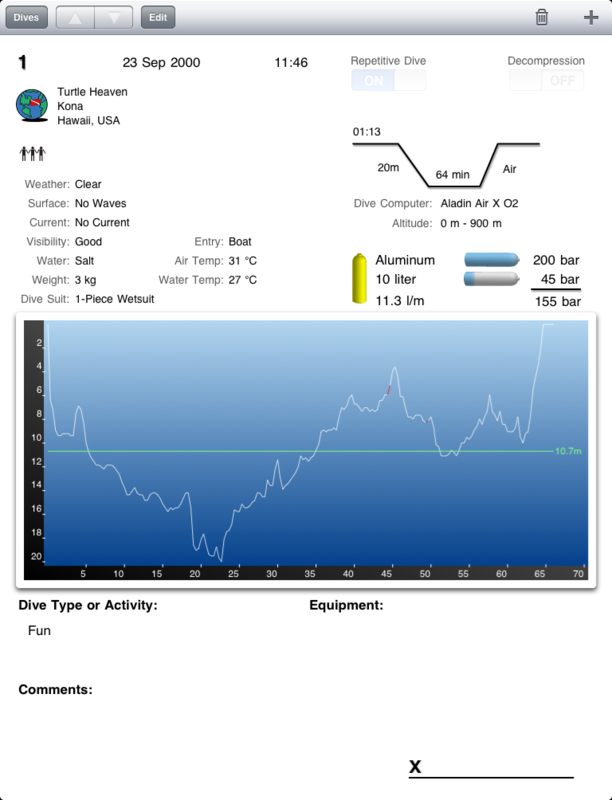 • You can now set additional information about your dive Equipment including purchase details, serial number, warranty information and upcoming service dates. There is a new setting in the settings tab to control how far in advance Dive Log will notify you about upcoming Equipment service dates. The default for this setting is “never”, but you can set a different period (for example “1 week before”) to turn on notifications. 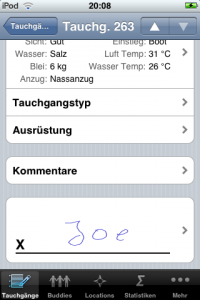 Notifications are indicated by the application badge. The application badge will be updated even when the application is not running if you are running on a recent version of the platform software* that supports push notifications. 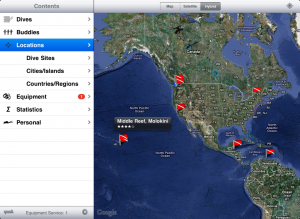 • Dive Log now shows Dive Site locations on a Map within the application if you are running on a more recent version of the platform software*. This new embedded map also has a new control to measure the approximate distance from your current location to the selected dive site. 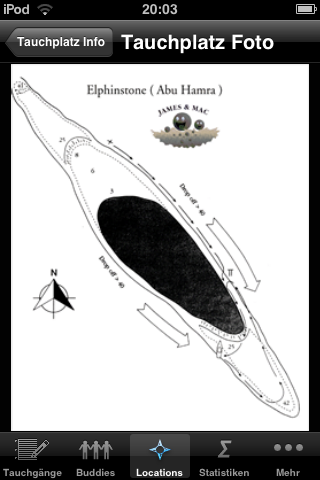 You also now have the option of getting directions to the site from the Maps application or a 3rd party navigation application if you have a supported one installed (see our website for details). • You can now rotate your iPhone and get a landscape view of each screen. 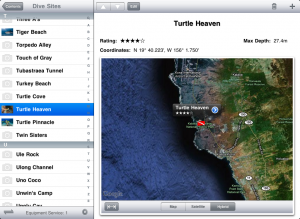 This is particularly useful in the photo viewer, the profile viewer and the new map view. You may also find it useful when typing in comments to take advantage of the more spacious landscape keyboard. Full landscape mode support is only available when running a more recent version of the platform software*. Many smaller improvements have also been added in response to specific customer requests. * – Dive Log will run on older versions of iPhoneOS, however for the best experience we recommend running on iOS 4. Apple has just approved Greg’s latest iPhone version 1.2, which has some great new features. 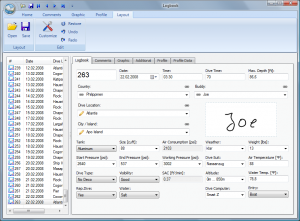 To take advantage of some of the features you should use already Diving Log 5.0 beta. Version 5.0 can store images (country flags, dive site photos, certification scans and personal photo) in the database additionally to linking the image file. That means, images added with Diving Log 5.0 will show up in the iPhone Dive Log 1.2 after synchronization. 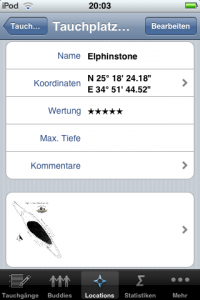 And images added on the iPhone will show up automatically in Diving Log 5.0 after syncing back to the desktop computer, even if the image files are not on your computer. Photos added to dives will not be stored in the database, because this would result in a really large database file, which slows down synchronization. To update your existing records and store linked images also in the database you must save each entry with an image again. Then you can sync your logbook to the iPhone and the images should be displayed. 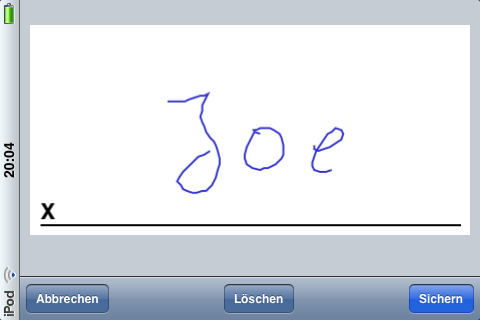 Another feature in iPhone Dive Log 1.2 is support for buddy signatures. 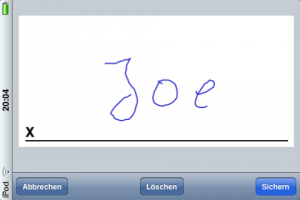 Your buddy can use his finger to sign a dive and you can sync the signature later back to the desktop computer and even print it. 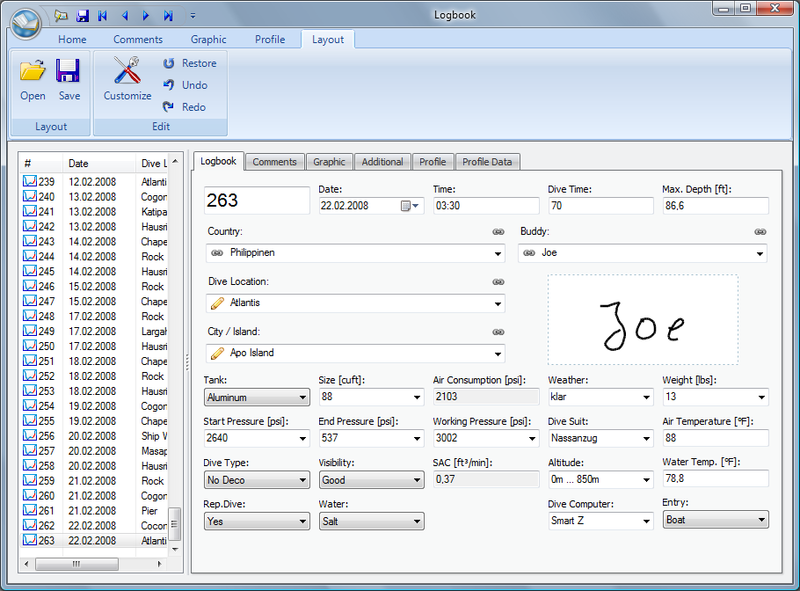 To display the signature in Diving Log 5.0 beta you must load the extended layout file or drag and drop the signature panel into the logbook window.